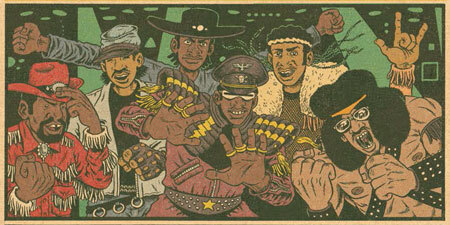 Pittsburgh cartoonist Ed Piskor joins Nick Marino and Shawn Atkins to discuss hip hop history, the formulation of taste, hand lettering, comics reprints, and more. Ed’s recently embarked on an ambitious new project — chronicling the genesis of rap music through a comprehensive Hip Hop Family Tree series for his Brain Rot webcomic on BoingBoing.net. But this isn’t Ed’s introduction to the history of rap music. He’s a passionate hip hop head with his own specific views on the development (and death) of the genre. And we don’t just talk about hip hop in this episode. We also dig into our mutual love of comics, covering topics such as: reading old original issues vs. recolored reprints, “Where’s Waldo?” X-Men, The Kubert School, assembly line comics production, the proportion wheel, and emotional connection to source material. The journey back from SPX 2010 was a long one, but more information than can fit on a floppy disk was shared and absorbed on a trek that felt like traveling the Kessel Run in less than twelve parsecs. Straight to the point: interviews with Roger Langridge, Ed Piskor, and the Full Sanction guys – our thoughts – how to buy books – how to sell – how to survive SPX.